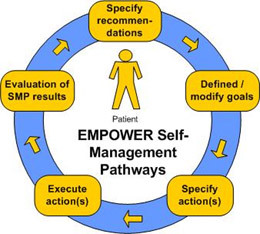 EMPOWER supports the self-management of diabetes patients through a modular and standards-based Patient Empowerment Framework. It helps sufferers of diabetes with observing daily patterns of living and with managing personalised action plans. services for monitoring of vital, physical, mental parameters as well as physical and lifestyle activities based on health standards. EMPOWER addresses long-term goals and short-term activities in order to facilitate the self-management of patients with diabetes and thus the treatment of chronic diseases. The pilot applications in Germany and Turkey demonstrate that the holistic and patient-centric approach of EMPOWER can improve disease management by personalised self-management services helping diabetes patients to cope better with their condition.